ODC Design was recently employed for the full refurbishment of McCain Foods head office which was completed over two stages. These works include a full upgrade of the front of house area including reception, waiting area and spacious staff breakout with banquet seating. Other improvements extended to the boardroom, multi-functional meeting space and workspace area. The look and feel of this project was to create an organic and earthy design to reflect a more environmentally sustainable workplace. This is reflected with timber flooring being used throughout the front of house waiting area and adjoining staff breakout. 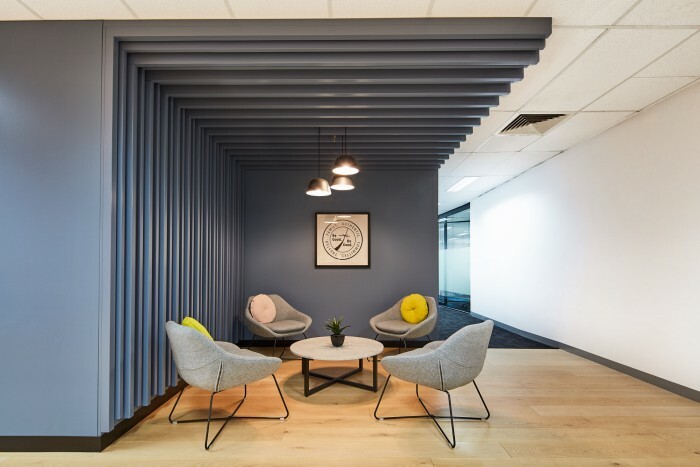 Timber panelling also adorns the walls and ceiling in the reception area and the introduction of indoor plants is featured throughout the back of house. ODC Design had previously provided design and construct services for McCain Foods’ original fitout at the same location. The featured large commercial kitchen from these earlier works has remained, with the addition of a new servery that is accessible from the new boardroom.